All of my research and teaching interests involve the whole earth, not part of it. Nevertheless, our educational system has programmed us to reduce the Earth down to its material spheres: Lithosphere, Atmosphere, Hydrosphere, Biosphere, Anthrosphere, and so forth. Alas, the concept of the “spheres” stays with us like the QUERTY keyboard, more through cultural inertia and the convenience of bureaucratic pigeon-holing than for pure utility. How easy it is to forget that: (1) all humanity evolves from biology; (2) all biology derives from from water; (3) all water derives from from the air (vapor); and (4) all that air was steamed out of molten rock. We also forget that a rock called coal exists because the biosphere extracted carbon from the atmosphere, and then the hydrosphere prevented the residues from being recycled back to the atmosphere, which allowed them to become lithosphere. So to what “sphere” does coal belong? From my perspective, it’s all one thing with geoscience at the bottom of the well and at the beginning of time. Bioscience is thus a specialty of geoscience. Hence, it’s no accident that, at the request of the geoscience faculty, I redesigned introductory geology to emphasize systems thinking: GSCI 1050 – Earth’s Dynamic Planet — Origin and history of planet Earth, emphasizing how rock, air, water, and life interact at different scales to produce the earth’s crust, landforms, life systems, natural resources, catastrophes, and climatic regimes. Provides a scientific context for human-induced global change. Following this introduction is a gateway course for all new majors at the sophomore level. Naturally, it’s title is GSCI 2500: Earth System Science. It’s also no accident that a sample of my scientific scholarly articles contains not one paper that doesn’t involve the overlapping sphere s. Link to Ten Scientific Papers. 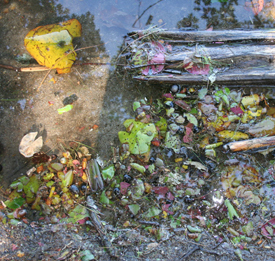 Photo: Ultra-clean water and plant detritus in Otter Pond, Standish, Maine created by low nutrient and high oxygen. This results from the fact that the surface-aerated water of Lake Sebago is filtered through a sandy moraine aquifer before emerging into an isolated kettle lake.